Juliet joined the team as a financial analyst and assists in appraisal production and financial analysis. 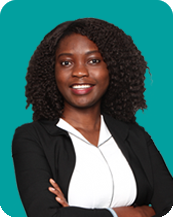 With a prior experience in business analysis and further studies, she is committed to improving business processes and reducing operation turnaround time. She has an MBA from Vancouver Island University and a prior undergraduate degree in Economics and is committed towards business and personal growth. During her downtime, she prefers to be with family and friends, enjoying some chats and cuisines.